The smartphone in your pocket is capable of many things -- including making payments to purchase tickets for use on public transportation, and a host of other useful applications for this emerging m-commerce technology. As consumer adoption of smartphones increases, usage of mobile devices to purchase goods and services has soared. The mobile phone user base, once cautious of using the technology, increasingly expects to be able to easily complete these transactions. 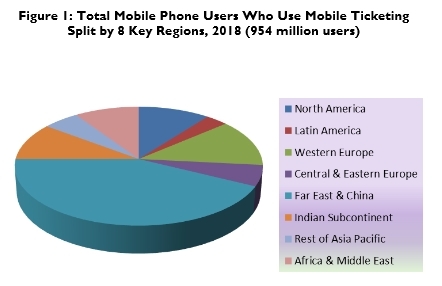 Just over 950 million mobile phone users worldwide are expected to use their handsets for mobile ticketing by 2018 -- that's up from 458 million this year, according to the latest market study by Juniper Research. Growth is expected to be driven primarily within key transport verticals, although significant uptake is anticipated across other key sectors -- such as live entertainment events and cinema ticketing. Juniper analysts noted that the airline industry was a particularly strong proponent of mobile ticketing, with adoption of mobile boarding passes rising sharply since the worldwide implementation of BCBPs (Barcoded Boarding Passes) in 2010. Furthermore, they observed that while mobile has already been a key ticketing delivery channel across Scandinavian metros, deployments were increasing both elsewhere in Europe and in the U.S. market. These applications are achieving strong levels of adoption. As an example, at Boston’s Massachusetts Bay Transportation Authority (MBTA) -- which introduced mobile ticketing in late-2012 -- mobile accounted for 10 percent of ticket sales within seven weeks of launch. However, Juniper also noted that in the short term, the outlook for Near Field Communications (NFC) ticketing was less optimistic, with a lack of implementation standards a key barrier to interoperability. Furthermore, transaction speed targets have yet to be achieved, providing a further obstacle to widespread deployments and increasing the probability that contact-less cards, rather than NFC handsets, will be the primary delivery mechanism. "We had already scaled back our forecasts for NFC Ticketing deployments in the wake of Apple’s decision not to include an NFC chipset in the iPhone 5," said Dr Windsor Holden, research director at Juniper Research. Given the outstanding technical issues and the continuing failure of NFC stakeholders to communicate the value proposition to transport operators, further downward revisions were required. Juniper Research says that they do not envisage anything other than ad-hoc deployments in the immediate future.